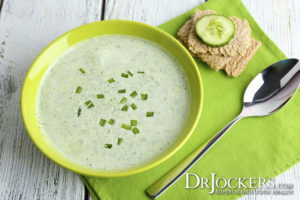 This cucumber soup recipe is from my wife Angel, who loves to make food and home and body care recipes that support people’s journey to optimal health. Check out my wife’s website and facebook page where she shares stories and pics about our life. 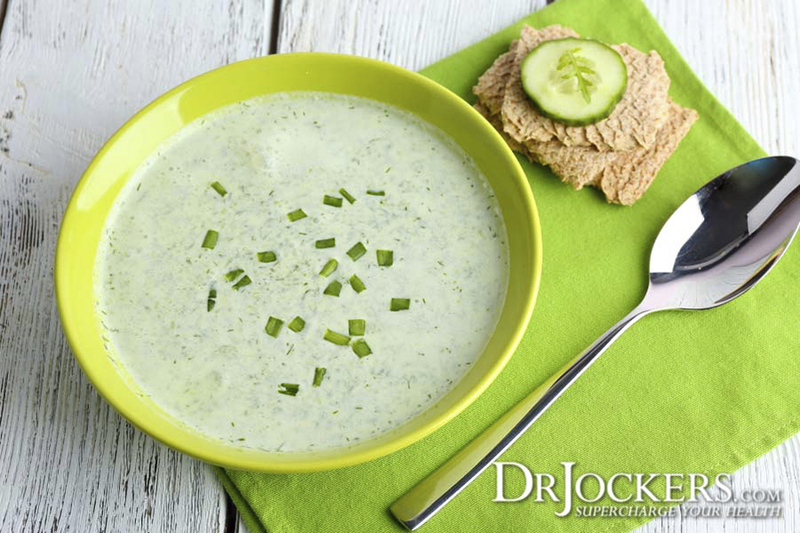 We know that you will LOVE this cleansing cucumber soup recipe! Step #1: Gather all the ingredients for the recipe. Step #2: Throw all ingredients in Vita Mix or powerful food processor for 1-2 minutes or until creamy. Step #3: Put into container and chill in the refrigerator for 20-30 minutes. Serve with minced chives, salt and pepper sprinkled on top. Step #4: Serve with some homemade keto crackers and enjoy! This recipe is so refreshing and energizing. Cucumbers are loaded with silica and potassium and are extremely alkalizing. The avocado makes this creamy and taste amazing and adds fat-soluble carotenoid anti-oxidants. Garlic and green onions provide immune boosting sulfur compounds and lemon provides tons of organic acids and vitamin C.
This soup will alkalize your body and help you de-inflame and fight off chronic disease. You will also feel light, refreshed and full of energy. The combination of ingredients helps you to feel satiated because of the nutrient density and the healthy fats that it contains. One of my favorite cleansing recipes and I know you and your family will love this too! We would love to hear about your experience with this in the comments section below! Hey, the whey product is not list d in the recipe. Is it not necessary? And where would I find that in stores in the Atlanta area? It is not necessary Katy!